INTERVIEW: Sparring with the Sensei with RISE OF THE TEENAGE MUTANT NINJA TURTLE’s Eric Bauza! Home » INTERVIEW: Sparring with the Sensei with RISE OF THE TEENAGE MUTANT NINJA TURTLE’s Eric Bauza! At San Diego Comic Con earlier this year, I had the opportunity to interview some of the cast of Nickelodeon’s newest iteration of everyone’s favorite terrapin protectors of New York City. The way things work in the press room though is that everyone is only given a limited amount of time, so a lot of questions are left unasked. This year was no exception. And with the launch of Rise of the Teenage Mutant Ninja Turtles on Nick imminent, there was so much more about the show that needed to be explored. I’m thankful, however, that recently, I was fortunate enough to spend some time recently with one of the cast members to delve further into the mechanics of creating a voice for a much-beloved animated character. Indeed, chatting with the endlessly talented and witty Eric Bauza is a delight. Fans of the franchise will know of Bauza’s role as Tiger Claw (and others) in the CGI-iteration of the Ninja Turtles that debuted in 2012. 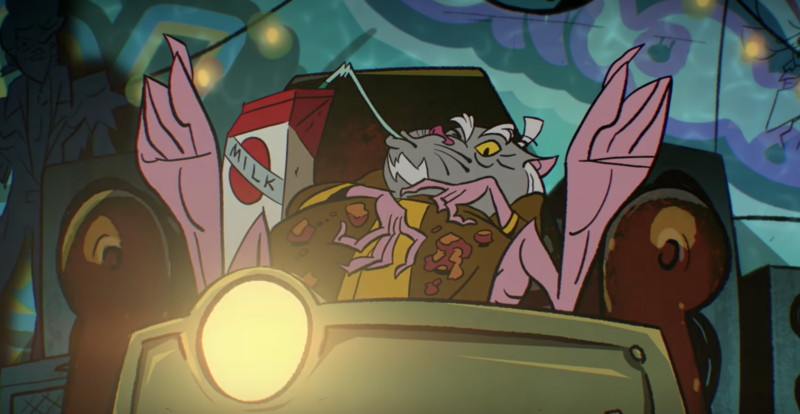 For the upcoming Rise series (which transitioned back to 2D animation), Bauza takes on a much more pivotal role as none other than Master Splinter, the Turtles’ adopted father and mentor. I began our interview by asking Eric, who is an OG fan of the Turtles from the early days, what it means to go from simply watching the Turtles to becoming a critical member its lore. AJ FROST: Hey Eric. So nice to chat with you today. The first item I wanted to talk to about is simply: What is your feeling about playing Master Splinter at this interesting time in Ninja Turtle history? Because we’re coming off the run of a successful iteration of the franchise (that you were also involved in) and now starting a new one. Can you describe your thoughts about taking over the mantle of this significant character role in this new show? ERIC BAUZA: To sum it up in one word: excited! Being able to be part of an already successful version of the show was one thing, but getting to come back to play one of the most iconic good guys in animation history (for a change) was so cool and a dream come true. FROST: What do the Ninja Turtles mean to you—as a fan and as someone who grew up watching the original animated show—to now not only be a part of the show, but to be the voice of a character that kids and adults will remember for a long time to come? Master Splinter as he appears in “Rise of the Teenage Mutant Ninja Turtles.” Courtesy of Nickelodeon. BAUZA: I just feel that ‘Teenage Mutant Ninja Turtles’ are four words that should never have been together in a sentence. But it just works, even though it’s one of the strangest ideas. I’ve talked to Kevin Eastman [co-creator of the Teenage Mutant Ninja Turtles] about it. I asked him: ‘Did you ever think, thirty-plus years later, that you would still be sitting here talking about these characters you created?’ And he said: ‘No. It was just a shot in the dark and, for some odd reason, people just latched onto the show.’ There aren’t a lot of shows out there that have stood the test of time as this series has. Growing up and watching it in its original run, and then being a part of this history only decades later, means such a great deal to me. FROST: Does it blow your mind that, not only are you part of this new Turtles show but that you have Rob Paulsen [original voice of Raphael] working as the voice director? Is there a surreal element of not only acting on this version of the Ninja Turtles, but also working with one of the original vocal creators? Eric Bauza. Photo by Gage Skidmore. BAUZA: It’s unbelievable that this is Rob’s first time out as the voice over director. He’s doing an amazing job. And who better to give the approval of these performances than someone who was there at the beginning? FROST: Did you read the comics growing up? BAUZA: I did, but I wasn’t into them as much as my brother was. The comics were definitely around the house and we had some of the original first issues of these black and white comics. But to see where the Turtles have to from those original, simple pen and ink drawings… there’s a new coat of paint on these characters and the fans are in for a real rollercoaster ride. FROST: Did you feel there was like a bit of a disconnect between the grittiness of those original comics versus fun of the cartoon? Or was it more like you could understand that the comics were only one version of the characters and the cartoons were a different version, but you could enjoy them both? BAUZA: I feel that it is one of those weird happenings where, yes, the franchise can get gritty, but it can also exist as a preschool show. We did a Ninja Turtles one-off show [Blast from the Past] that still worked even though [it was created for young audiences]. We had these pre-teen Turtles (they were like, 12 years old) and these pre-teen versions of the bad guys and it still worked. For some odd reason, these characters work in that context or as part of a big-budget film with Michael Bay attached to it. It’s still something that people flock to the theater to see. FROST: Moving on from the Turtles for just a brief second, I wanted to ask you a little bit about your background in animation. When you started out your career, did you think that voice acting would be the primary avenue for you in animation or what is something you found yourself doing through circumstance? BAUZA: I feel a little bit of Column A and a little bit of Column B. I knew that I wanted to do voices, but I didn’t know how to get into it at the time. And I thought being around people who make cartoons would be a surefire way to getting a shot at voicing a cartoon. I didn’t go to school for dramatic arts, so I had to learn on the job. It was tough at the start because I was starting to work with people who had been doing this work for generations. I learned from them. I am where I am today because of the people that I grew up watching on TV. I’m lucky now to call them friends. It’s surreal to me. Master Splinter in “Rise of the Teenage Mutant Ninja Turtles.” Courtesy of Nickelodeon. FROST: And your first major role was Stimpy in the reboot of Ren and Stimpy? BAUZA: Right! I had the opportunity to voice Stimpy, who I put up there with the all-time greats like Bugs Bunny, Popeye, Mickey Mouse. He was a very iconic character for Nickelodeon and set the standard for art in general. For me, Billy West will always be Stimpy. I just got to step in for just a couple episodes of a very different show. FROST: Your path has really been quite interesting to follow because from that Stimpy role, a cursory glance at your IMDb shows that you’ve voiced hundreds of characters. At this moment in your career, where do you see your trajectory going in the next five years or so? And I ask this of someone who’s had the opportunity to give voice to all classic Warner Bros. characters to Nickelodeon staples through the Ninja Turtles and beyond. BAUZA: I’m pretty happy where I am right now. But one day, I would love to run my own show. I have a couple ideas that I’ve been thinking about how. I still like to draw, not professionally, just for myself. My dream would be to run a show, but that is definitely a big task. I see the people who are doing it now and it’s like they are back in college: up at all hours to make sure that their show is done right. I feel that that would be something that would take me away from voiceover for a bit. But I don’t know if I’m ready for that. I kinda like coming to work in my pajamas [Laughs]. FROST: Going back to the Turtles for a moment. How did you find the voice for this version of Master Splinter? We talked about how you’ve been a fan of the franchise since the beginning. So how did you create a voice that was unique to your own your own sensibilities but also carried the legacy of all these previous iterations of the character? And how did you make it sound fresh for this new audience? The Mutated Gang is back for more hijinks! Courtesy of Nickelodeon. BAUZA: It all comes down to the writing and how the writers want to portray the character. [Show creators] Andy Suriano and Ant Ward had a specific vision for Splinter. And I feel that when viewers see Rise of the Teenage Mutant Ninja Turtles, it’s a bit like a reboot, not just of the show, but of the characters themselves, including Master Splinter! We’re exploring the characters before they become full-fledged ninjas, before they truly find their way. And I think this goes with Master Splinter as well. In a sense, we’ve all grown to know this stoic character with a few moments of comedy. In this reimagining, he’s more aloof and comedic and when he’s a bit more serious and stern, that’s when he catches you. That’s when it means the most to him. FROST: What do you think will surprise older fans of the Turtles with this show and this version of Master Splinter? What will surprise viewers checking out the Turtles for the first time? BAUZA: That I’m excited to be going to work whenever they call me to do this character! But also, going into the toy aisle of a department store and seeing Master Splinter on the shelf is a surreal experience having collected all the original action figures from the first run and knowing that it’s my thumbprint on the character. It’s amazing and all my appreciation goes to the fans. Without them, why would we be making this show in the first place? Rise of the Teenage Mutant Ninja Turtles premieres on Nickelodeon on Monday September 17th.